A report is a formatted presentation of a particular type of information. Geocortex Reporting specializes in presenting data and images related to web maps. Reports are designed by report authors (administrators) using a web-based tool called Geocortex Report Designer. They are saved to the Geocortex Reporting service, with an item in the content area of the author's ArcGIS account. To allow users to run a report, the author shares the ArcGIS item with them. End users use the reports designed by the author to create on-demand, print-ready reports about maps and their features. End users run reports from web applications that the author has configured to host the reports (host applications). The output report is a PDF. Geocortex Report Designer provides an extensive suite of tools for laying out reports, specifying the data that you want to include, and presenting the data using charts, tables, and a wide variety of other configurable elements. Report Designer has a built-in Preview environment for running reports. Using the Preview is the quickest way to test a report while you are designing it. When you author a report in Report Designer, one of your tasks is to specify the data that you want to include in the report. Geocortex reports can include spatial and non-spatial data from ArcGIS services and tables, or from databases like SQL Server and Oracle. When a user runs a report, the data references in the report are populated with their values from the data source. A single report can get data from multiple data sources. The data that you include in reports is stored in data sources. To get data from a data source like an ArcGIS service or a database, Geocortex Reporting needs to know how to connect to the data source. To provide this information, you configure the data source's connection information in Report Designer. 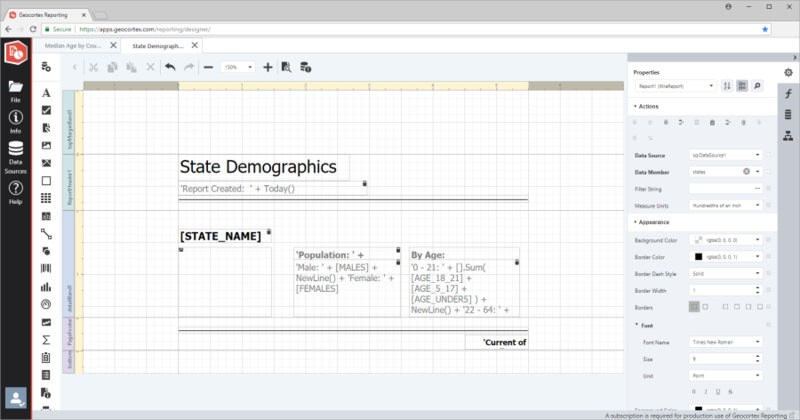 You then add the data source to your report and configure the query that will get the data. To limit the data that is included in a report, you can place conditions on the query or pass input parameters to the report. You only need to configure a data source's connection information once. After that, you can use the data source in any report that you author. Report parameters allow you to pass inputs to a report when the report runs. Geocortex Reporting supports passing ArcGIS feature IDs as inputs to reports. Typically, a user will select some features on the map or from search results and then run a report on the selected features. Report parameters make it possible to include in the report just those features that the user has selected. A subreport is a report within a report. Subreports are used to present related data from a secondary data source. In one common scenario, a report includes features from an ArcGIS layer and, for each feature, related data from an external database. A report's layout defines the structure of the report—the sections in the report and the information in each section. A control is an element that you add to a report to present a particular piece of information. Controls can be static or dynamic. Static controls are controls whose value you set when you design the report. Dynamic controls get their value when the report runs. Reports are divided into sections called bands. There are different types of bands that you can add to a report. When you create a new report, it has bands for the top margin, the bottom margin, and a detail band in the middle. Detail bands are used to display the details of the report, in particular, data. When a report is generated, the contents of the detail band are repeated for every record. Report Designer provides a design surface where you lay out and format the elements that you want in the report. To lay out a report, you add bands to the design surface; drag controls onto the bands; resize, align, and format the controls; and configure the contents of the control.